NEW YORK – Oct. 12, 2016 – Nickelodeon today announced the kick off of a multi-platform cause marketing partnership with Canine Companions for Independence®, a non-profit organization that enhances the lives of people with disabilities with highly trained assistance dogs. The initiative features a Public Service Announcement (PSA) starring the dogs of Canine Companions and heroic pups from Nickelodeon and Spin Master Entertainment’s hit animated preschool series PAW Patrol. The PSA will air across the network’s linear and digital platforms, and the partnership will also include experiential activations at select events across the U.S. through 2017. 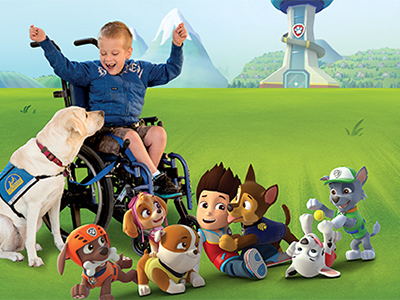 Beginning Thursday, Oct. 13, a PSA that features the PAW Patrol pups and highlights the work of Canine Companions’ dedicated four-legged heroes will debut on Nickelodeon and stream on NickJr.com, the Nick Jr. App and CCI.org. Additionally, the partnership will include on-the-ground activations at Canine Companions events including DogFest San Diego (Oct. 29) and DogFest Orlando (Nov. 19), as well as select stops on the recently announced PAW Patrol Live! : Race to the Rescue tour, presented by Nickelodeon and VStar Entertainment Group. Starting January 2017, Canine Companions will also offer supporters who make any donation to the organization a custom PAW Patrol-branded coloring book, while supplies last. For more information, visit cci.org/PAWPatrol. Now in its third season, PAW Patrol is a top-rated CG-animated series starring a pack of heroic rescue pups--Chase, Marshall, Rocky, Rubble, Zuma, Skye, Everest and the newest pup Tracker--who are led by a tech-savvy boy named Ryder. Together, they work hard to show the people of Adventure Bay that “no job is too big, no pup is too small!” Produced by Spin Master Entertainment, the series features a curriculum that focuses on citizenship, social skills and problem-solving. PAW Patrol airs weekdays at 12 p.m. (ET/PT) on Nickelodeon. Canine Companions for Independence provides highly-trained assistance dogs free of charge to children, adults and veterans with disabilities. Established in 1975, Canine Companions has trained over 5,000 assistance dog teams, with six training centers across the country including Northern California, Southern California, Florida, New York, Ohio and Texas, and over 3000 volunteers nationwide. Canine Companions is recognized worldwide for the excellence of its dogs, and the quality and longevity of the matches it makes between dogs and people. The result is a life full of increased independence and loving companionship. For more information, visit cci.org or call 1-800-572-BARK. Spin Master is a leading global children's entertainment company that creates, designs, manufactures and markets a diversified portfolio of innovative toys, games, products and entertainment properties. Spin Master is best known for award-winning brands including Zoomer™ Dino, Bakugan Battle Brawlers™, Air Hogs®, and 2016 Toys of The Year, Bunchems and Meccanoid G15. Since 2005, Spin Master has received 64 TIA Toy of The Year (TOTY) nominations with 18 wins across a variety of product categories. Spin Master has been recognized with 12 TOTY nominations for Innovative Toy of the Year, more than any of its competitors. Spin Master is among a limited number of companies that not only develop and produce global entertainment properties, characters and content, but also monetize that content through the creation, sale and licensing of products. To date, Spin Master has produced six television series, including 2007 hit series Bakugan Battle Brawlers and its current hit PAW Patrol, which is broadcast in over 160 countries and territories globally. Spin Master employs over 1,000 people globally with offices in Canada, United States, Mexico, France, Italy, United Kingdom, Slovakia, Czech Republic, Germany, Sweden, the Netherlands, China, Hong Kong, Japan, and Australia.